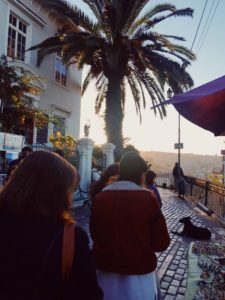 Last semester I was writing for Wofford but on a different blog, documenting (admittedly infrequently) my research project in tangent with my semester in Valparaíso, Chile. If you want to read more about my time and experiences from South America, check out Wofford College’s Presidential International Scholar blog. Now it’s time I take on a new role: a spring-semester junior with no research project and just 12 weeks to enjoy as much Parisian and Roman culture as possible–just, not yet. I’m actually still in South America, specifically Peru, where I am wrapping up my research. As I have just begun to prepare mentally (I’ll have a week in the States to prepare physically and swap out my wardrobes), I sipped my coffee this morning and thought about the pre-departure orientation sessions the OIP provides for its students embarking on new adventures all around the world. There’s really a lot that goes into preparing for 3-5 months of living in another country. So what does pre-departure preparation look like when I still have a departure to make before my actual departure for Europe? I started with a countdown. Only 10 full days remain of my time on this continent, so with the thousands of photos I have collected, I’m attempting to visually condense six months into 10 days worth of Instagram stories. The first step was to curate a few dozen noteworthy moments and memories. As I scrolled up to the very first photo I took in Chile, I realized I was overlooking some of the photos I forgot I had taken and haven’t looked back on before. Today’s photo (Countdown: 10) is from my walk with my host-mom, plus two girls and their host moms. As life would have it, the back featured in this photo belongs to one of the girls who became my best friend in the program. Today she has landed in Barcelona to start her own second semester abroad. The red jacket and beanie-wearing girl is Fi, and we are walking around a mirador that I soon became familiar with, although in this picture I was so disoriented! I didn’t become best friends with everyone in my program, nor did I find a Chilean to be close with all semester long, but I did get to know incredible people. My relationships from Chile have certainly shaped me. Preparing for semester #2 in Paris and Rome, I have a privilege in knowing what it’s like to rapidly make friends in new settings and what it’s like to say goodbye to those friend. I’m so lucky that my goodbye with Fiona was truly a “see you later”, because I don’t know how I would’ve handled it otherwise. Fiona was the one who took my pictures after my first surf lesson and adventured with me on our first weekend trip of the semester; she lived in the neighborhood over from mine, was always on my energy level, shares similar travel experiences as me, comes from the Mid-Atlantic region (East coast may not be the best coast, but it’s still my coast). Very much influenced by my semester in Chile (and truly my interim in Nepal and Tibet with Wofford students I barely knew before getting on the plane), my 2019 resolution is about intentionality with friends. Once my plans for my year abroad were confirmed, I yearned for the moments I was sure would mark my growth as a young and independent woman: moments of solitude, traveling alone, taking on the world all by myself. I glorified this idea. I was naive. I still relish quiet mornings and the freedom of traveling on my own sometimes, but semester #1 certainly prepared me for semester #2, where I will have fewer opportunities to spend weekends on my own. Time will be limited, for one, but I also will be on the same continent as many friends and will want to admire the collection at Amsterdam’s Van Gogh museum and taste true Belgian frites in good company. Leaving in 10 days also means resolutely saying goodbye to cities of people I came to love. From the professors at La Católica, the small congregation at Iglesia Pródigo, Leo from Cafe Vocare, my hostel friends in Montevideo, the Dempsey family who welcomed me into their family for Christmas in Brazil, and the small office at Threads of Peru in Cusco, I have been apart of a collection of communities these past 6 months. How does one depart from a place where they have made a home? How does one prepare again to find their way all over again into new communities? I’m not sure I have the right shoes for Paris and I’m not far enough along in Italian on Duolingo, but those inadequacies don’t scare me. Because of my journey so far, I realize that the most important pre-departure preparations have to do with my heart: the willingness to put yourself out there and find community in a world you don’t yet know is not like packing a suitcase or filling out visa forms. Sure, some of my pre-departure preparations for Europe are a little nuanced since I have yet to depart from South America; for example, searching for train tickets from Paris to Rome and picking classes on fashion & business feels a little funny when I feel like my last semester’s education emphasized dictatorships, political music, and how to get better at spotting the next wave to catch. Having to think only about Euros when I’ve been keeping up with exchange rates in Chile, Argentina, Uruguay, Brazil, and Peru feels like a relief. I’m ready to turn in my hiking boots–which I brought for hiking and a camping trip in the world’s driest desert–for chunky feels and maybe some loafers. The important tip is this: in order to prepare myself for Europe, I have to prepare myself to depart from South America. The weather, the landscapes, the food, and the people have all been so good to me. I’m excited to say hello to brie cheese (oh, how I’ve missed you), but I’m not excited to say goodbye to all the quinoa my heart could ever want. I’ll miss the various distances I’ve lived from the Andes, I already miss my Saturdays floating on a surfboard, I’ll miss the fun of jumping on micros and the challenge of navigating my exit from an over-stuffed bus. I’ll miss learning new Spanish lingo, the traditional music mixed with today’s political ballads by Ana Tijoux and Denise Rosenthal on the radio. I’ll miss it all. I’m not sure I’ll find more time in my remaining 10 (really now 9 1/2) days on this continent to blog, so I think the next time you hear from me I’ll be dreamily wandering the boulevards of France, probably a bit wistful for Cusco’s Incan-era cobblestone streets and Valparaíso’s steep hills.